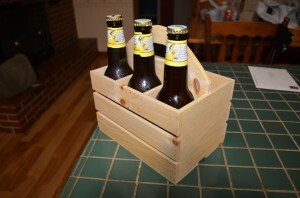 It’s time to wrap up the construction of the wooden drink carrier (six-pack) so we can all get back out in the sun and enjoy the rest of our summer (or for our friends in the southern hemisphere…prepare for the summer). Today’s episode we pickup at the bandsaw where we’ll shape the middle divider and then continue from there to create some finger holes for easier carrying and then on to final assembly. There’s also a little discussion about materials for building your own and possibly some dimensions for carrying larger bottles than the standard 2.5″ diameter size used for this particular version. If you decide to make one or something very similar, please share your pictures and results. I know I’d love to see it! Nice drink carriers. I like the stacking feature, be sure to include it in any others you make. Excellent project Matt. For my version I’m thinking contrasting colors and finger joints for the side panels to really play off the contrasting colors. That would be cool!!! I’m thinking I need to make another one and try something cool with the joinery also. Great episode (as usual). I realize it wasn’t warranted for this project, but you never seem to fire up your drill press anymore. It looks lonesome in the background. Just saying. It is the neglected child of the shop…almost more than my power miter saw. I’m sure I’m not the first person to think of this, but your project inspired me to build some boxes to hold individual wine bottles. That way I can give someone a $7 bottle of wine as a gift and they’ll think I dropped a bundle. I was thinking the same thing as Patrick, but make the drink carrier and give it as a gift with a sis pack of drinks inside. I bet I would be invited to more BBQ’s that way. Great project. Keep up the good work. How difficult would it be to expand the carrier to add 2 more spots? I’m thinking of a pic-a-nic basket idea, with condiment bottles, beverage holders, napkins, and maybe silverware. Not difficult at all. The size is extremely easy to adjust. I’m working on a Sketchup plan to share. Awesome idea!!! I wanna use some of my scrap 3/4″ walnut and sapele to make a greene and greene version. Thanks for the great inspiration! !